The Maine Outdoorsman: Northern Pintail (Anas acuta) in Maine? 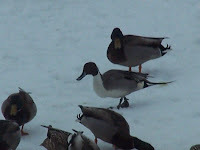 Northern Pintail (Anas acuta) in Maine? This photo was just e-mailed to me from a friend in Jonesport-Beals, Maine. Any duck hunters on the site are sure to enjoy the sight of this BEAUTIFUL Pintail feeding with a flock of Mallards. If anyone else has any rare duck sightings please send to me and I will post. Interesting, I did see a Greenwing Teal down in Ellsworth hanging with the blacks and mallards in January, as far as I know he's still there. Those ducks hanging out at the library in downtown Ellsworth always crack me up. Greenwing is a pretty duck and DELICIOUS!